Learn about the winning projects. Read about the winning projects in Lab Design Newsletter. Read about the winners in Eco-Structure. Caitlin Ranson and Dianah Katzenberger of Clemson University accept their award from Anthony M. Babauta, Assistant Secretary for Insular Areas for the U.S. Department of the Interior (second from left), and Stephen Meinhold of the University of North Carolina Wilmington (far left). 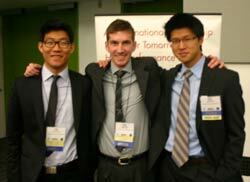 The Carnegie Mellon University winning team poses: Dan Addis, Eui Song (John) Kim, and Jensen Ying. The University of Kansas Honorable Mention team stands with their awards: Taylor Maine, Sara Lichti, Ike Chinonso Onyekachi, and Arthur Joel Herman. 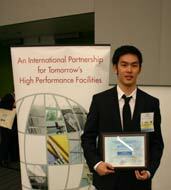 Carnegie Mellon University Honorable Mention Won Seok Chu stands with his award. 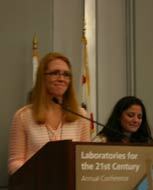 Both winning teams spoke during the Labs21 2012 Annual Conference Opening Plenary. 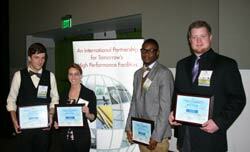 Both winning teams also presented in a technical session at the Labs21 2012 Annual Conference. Inspired by the success of the Laboratories for the 21st Century (Labs21®) Student Design Competition (2003–2004) I2SL planned the International Sustainable Laboratory Student Design Competition in partnership with the Joint Institute for Caribbean Marine Studies (JICMS) and in collaboration with the Association of Collegiate Schools of Architecture (ACSA). This competition enabled architecture and engineering students from around the world to provide new and innovative thinking for the creation of energy-efficient and environmentally sustainable laboratories. View the competition program on ACSA's website. JICMS and I2SL believe their combined efforts elevated the need for energy-efficient and environmentally sustainable laboratories as an essential element to the educational, economic, and social success of nations and communities. This competition defined the students' perspectives and advanced building innovations that cannot afford to be limited by accepted industry practices. Therefore, the organizations worked together to promote this milestone competition to utilize the unfettered creativity of students to help shape the future for sustainable laboratory design and engineering. ACSA has access to a worldwide network of academic institutions which will ensure the broadest level of student participation. ACSA's more than 250 member schools include representation by more than 5,000 architecture faculty. In addition, more than 500 supporting members composed of architecture firms, product associations, and individuals add to the breadth of interest and support of ACSA goals, which include the International Sustainable Laboratory Student Design Competition. Learn more about the competition project. 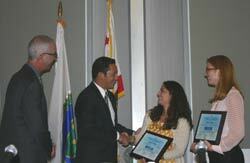 Learn about the winning projects on ACSA's website.